Abstract-Over the decades when major reforms and policies were introduced the manufacturing sector could not keep up compared to the countries with similar development/growth phase and size. National manufacturing policy aims at enhancing the share of manufacturing in GDP to 25 % within a decade and creating 100 million jobs. The government has made efforts to provide favorable by simplification, rationalization and digitization of process. In this regard, ‘Make in India’ initiative is aimed at encouraging the spirit of entrepreneurship and making India the manufacturing hub of the world. This article takes a look at what has been done so far and what more needs to be done to give much needed force to the manufacturing sector. Secondary data has been utilized taken from various sources to advocate the views expressed in this article. Indian economy which has traditionally been agriculture based, is taking big leaps towards promoting manufacturing which constitutes 16% of GDP in India. But its contribution to employment sector and growth is well below its true potential. Restrictive and rigid labour laws, abundance of unskilled workforce over skilled workforce, lack of technology innovations are some of the factors contributing to this. ‘Make in India’ calls for clear vision, detailed planning, strong determination, vast resources, and efficient administrative instruments to achieve this monument task. It will automatically lead to more and more employment opportunities and a better quality of life. Keywords:Manufacturing, Simplification, Rationalization, Digitization and Innovation. The rapid expansion of manufacturing sector has been a major objective of economic policy in India. Starting with the second five year plan in 1956 and with the contemporary launching of ‘Make in India’ approach, policy makers always stressed the need to expand India’s manufacturing sector. Manufacturing is the backbone of the economy in most countries, especially so in fast growing emerging markets. Historical evidence from different parts of the world demonstrates the indispensable role that industrialization plays in the economic development process of countries. The experience of East Asian countries, in particular, shows that export led industrialization is crucial for the attainment of sustained employment generation and poverty reduction. Indian economy which has traditionally been agriculture based, is taking big leaps towards promoting manufacturing which constitutes 16% of GDP in India. But its contribution to employment sector and growth is well below its true potential. Restrictive and rigid labour laws, abundance of unskilled workforce over skilled workforce, lack of technology innovations are some of the factors contributing to this. Over the decades when major reforms and policies were introduced the manufacturing sector could not keep up compared to the countries with similar development/growth phase and size. National manufacturing policy aims at enhancing the share of manufacturing in GDP to 25 % within a decade and creating 100 million jobs. The government has made efforts to provide favourable by simplification, rationalization and digitization of process. In this regard, ‘Make in India’ initiative is aimed at encouraging the spirit of entrepreneurship and making India the manufacturing hub of the world. This article takes a look at what has been done so far and what more needs to be done to give much needed force to the manufacturing sector. Secondary data has been utilized taken from various sources to advocate the views expressed in this article. India is a country which has experienced a growth in GDP driven by its service sector throughout the last few decades; however the service sector led growth has largely been jobless, thereby creating large segments of unemployed population. 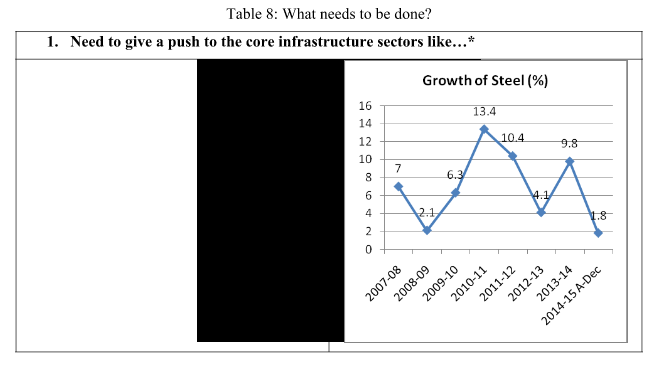 We must consider that the Index of /industrial production has languished in some previous years, dipping into negative territory in 2013-14, as mega projects got stuck in huge time and cost over runs. While a good start has been made towards promoting the ‘Make in India’ initiative and inviting global companies to look at India as a potential manufacturing destination. It is clear that the Indian economy to successfully distribute wealth across its population, manufacturing has to grow. This growth will require several significant changes including significant increase in productivity and quality at the plant levels, pursuit of worldwide competitive manufacturing strategies and operations and successful integration into the global supply chains. The importance of manufacturing sector is reviving the fortunes of the economy is well understood. What is less noticeable, however, is what prevents the manufacturing industry from growing faster. The five focus areas are: - capacity utilization, encouraging alternative technologies, power sector, incentivizing utilization, and defense production and localization. ‘Make in India’ calls for clear vision, detailed planning, strong determination, vast resources, and efficient administrative instruments to achieve this monumental task. It will automatically lead to more or more employment opportunities and a better quality of life. To conclude one can say that manufacturing sector has the potential to play a crucial role for India to achieve its goal of becoming the fastest growing economy in the world. And the right mix of strong commitment from the government as well as the industry can make this a reality. 1. Daily readings of The Economic Times, Kolkata addition. 2. Sundaram, Asha, D mitra, (2013), “Complementarity between formal and informal manufacturing in India in Reforms and economic transformation in India”, Oxford University Press, New York. 3. Hasan ,Rana, Mitra, Asha Sundaram, (2013b) “What explains the high Capital Intensity of Indian Manufacturing”, Indian Growth and Development Review, 6(2),212-241. 4. Panagariya, Arvind (2007), “India lags behind China and how it can bridge the gap”, World Economy 30(2): 229-248. 5. 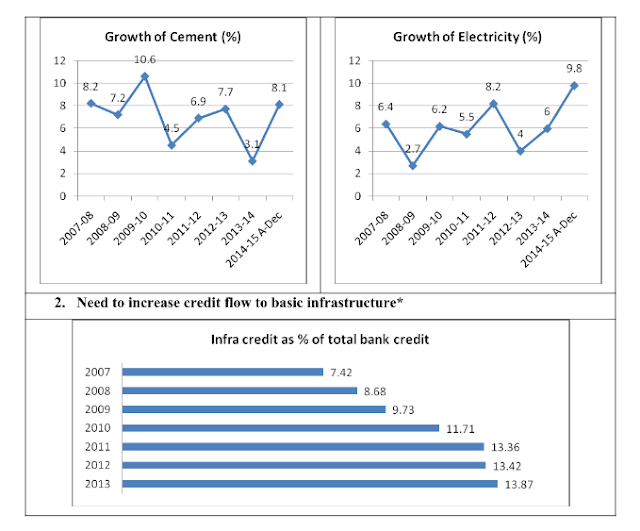 Economic Survey, various annual reports.